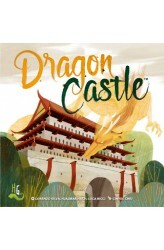 Dragon Castle is a game freely inspired by Mahjong Solitaire. During your turn, you take a pair of identical tiles from the central "castle" (known as the Dragon Castle) and place them on your own realm board to build your own castle. From time to time, you may sacrifice these tiles to acquire shrines in their place. Every time you create a set of tiles of the same kind, you "consolidate" them, i.e. flip them face down to score points. When you consolidate a set, you may also build shrines on top of the consolidated tiles: Shrines allow you to score more points, but they also limit your building options. You may also take advantage of the available spirit card and its game-changing powers...but this will come at a cost! Finally, don't forget to check the dragon card in pla.. In the multiplayer puzzle game Railroad Ink, your goal is to connect as many exits on your board as possible. Each round, a set of dice are rolled in the middle of the table, determining which kind of road and railway routes are available to all players. You have to draw these routes on your erasable boards to create transport lines and connect your exits, trying to optimize the available symbols better than your opponents. The more exits you connect, the more points you score at the end of the game, but you lose points for each incomplete route, so plan carefully! Will you press your luck and try to stretch your transportation network to the next exit, or will you play it safe and start a new, simpler to manage route? 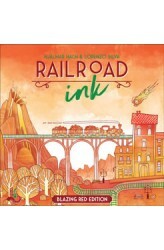 Railroad Ink comes in two versions, each one inclu..